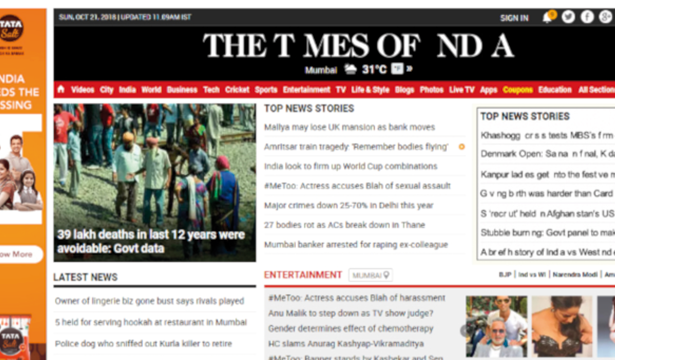 In India, our partners at Tata Salt captured the attention of the media and the nation when they rolled out the #MissingI campaign, taking the letter ‘I’ out of national headlines in order to create awareness of the importance of iodine in the diet for Global Iodine Deficiency Disorders Prevention Day on October 21st. It was then unveiled that the #MissingI is Iodine, and consumers were asked to check whether the missing ‘I’ is missing from their body too. 'I' was missing in the Indian Times on Global IDD Prevention Day, bringing attention to the importance of eliminating iodine deficiency. The campaign had a staggering reach and impact. The letter ‘I’ went missing from the online portal of Times of India, and from headlines on Republic, a popular news channel, as well as tweets by major social media influencers such as cricket commenter and journalist Harsha Bhogle, and cricketer Gautam Gambhir. On Twitter, the campaign trended for about 17 hours, garnered about 20,000 conversations, and made tens of millions of impressions, according to Social Samosa . The campaign urged the nation to choose iodized salt. The day was a giant success for India and for Global Iodine Deficiency Disorders Prevention Day. 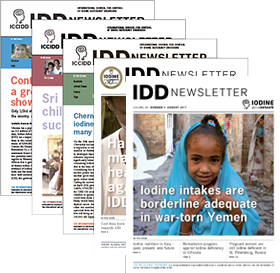 India, with the second largest country population in the world, has adequate iodine intake at the national level, but significant disparity between populations and states, and insufficient iodine nutrition among pregnant women (IGN Global Scorecard of Iodine Nutrition 2017 ). In Tamenglong, India, the District Health Society observed the day with a gathering of doctors and dignitaries at the District Hospital Duigailong, Tamenglong (Imphal Free Press ). In Gujarat, India, UNICEF launched an IDD awareness campaign at a Higher Secondary School in Gandhinagar, in collaboration with Health and Education Departments of Government, that included school children chanting and handing out leaflets (UNICEF India ).